As you walk around the city of Athens, you’ll come across various emblems of art that unravel a glorious history, acknowledged throughout the world. 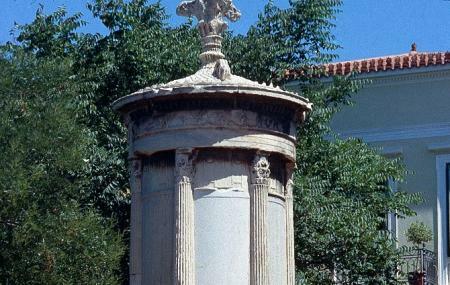 Built in the 4th century BC by Lysicrates, a wealthy citizen of Athens, the Monument of Lysicrates is the best preserved choragic structure that graces the city of Athens. Such monuments were built in ancient Greece with the purpose to keep trophies and to thus eulogize the nation to an extent. Measuring over nine meters high this monument looks beautiful with its tholos, which is actually a circular structure with Corinthian columns covered with a marble roof. Do have a look at it as you move towards the Theatre of Dionysus. How popular is Choragic Monument Of Lysicrates? People normally club together Byzantine Museum and Pnyx while planning their visit to Choragic Monument Of Lysicrates. A beautiful place with a great architecture. It's also a great place for photos. It is worth visiting. One of the beautiful monuments of Athens. It's in the centre of the city, near the Acropolis, its museum and the old Athenian neighbourhoods. Walking is pleasant, but certain obstacles cannot be avoided. An historical monument in the middle of Plaka, the tourist neighborhood. A piece of peaceful reflection in the middle of a hubbub. Extraordinarily monument , gives you the chill. It’s worth it to visit.